When you visit your dentist for a consult and examination you will usually be asked to make a radiograph so your dentist can be completely familiar with your dental status. 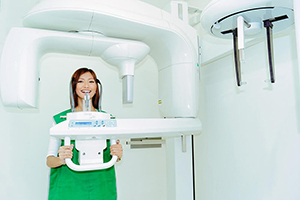 There are many types of dental radiographs and your dentist will decide which one is right for your case. In most cases, firstly, you will be advised to make panoramic radiograph that will present all your teeth and both, upper and lower jaws. Sometimes your dentist will ask for additional radiographs for certain teeth. This is usually enough for diagnostic procedures for carious lesions, endodontic treatments, and most extractions. However, in some cases, other types of scans are needed. 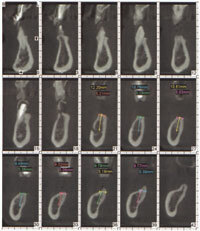 A novel approach in dental radiography is related to three-dimensional scans or advanced CT’s called DVT (Digital Volume Tomography) or CBCT (Cone Beam Computed Tomography). 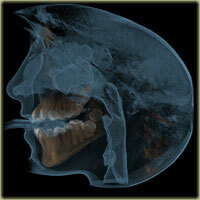 DVT is simply three-dimensional radiograph of any facial structure. Both jaws with all their anatomical details including teeth can be presented. These images can be displayed in all plains: axial, coronal, sagittal so as overall three-dimensional viewing. While in conventional radiographs all structures are presented in two dimensions, DVT shows anatomical structures in three-dimension presented in small cubes called voxels. This means that any part of the jaw can be visible from any direction and through the entire anatomical structure, all the way through the bone and teeth, so as the empty spaces such as maxillary sinus. Since that DVT provides cross-sectional images of anatomical structures it will be easy for your dentist to make the best possible assessment in certain cases. When and why will DVT be suggested? There are few conditions when your dentist will suggest DVT. Sometimes, after examination and analysis of your radiographs, when extraction is planned especially when wisdom teeth are considered for surgical extraction, DVT can be very helpful for assessment of its position and probable breakage of the neighbor anatomical structure. This type of radiographs can also be useful when planning endodontic treatment for hardly visible canals. Probably, the most significant role DVT plays in pre-implant check-ups and planning their placement in the first place. Since conventional radiographs give the only two-dimensional image of anatomical structure there was a reasonable urge for three-dimensional presentation of future implant place that leads to the development of improved CT scans in dentistry. How DVT affects the pre-implant planning? When you and your dentist decide that you are a candidate for one or more implants next step is planning of types and position of your future implants. When the place of implantation is determined the evaluation of anatomical structures is necessary. Firstly, the assessment of reliable bone followed by the assessment of neighbor anatomical structures. In the lower jaw, the position of the mandibular canal that contains inferior alveolar nerve, mental foramina, and neighboring teeth are structures that should be included in consideration, while in the upper jaw that would be maxillary sinuses, nasal cavity, nasopalatal canal and present teeth. This analyze is of great importance since all of the named structures can be damaged during implant placement if previous planning fail. As it was mentioned before, DVT gives the opportunity to analyze any part of jaws by slices and from any aspect in three-dimensions. This is how you dentist will know if there is enough bone for the future implant, are there some radices left from the previous extraction, is the infection inside of the bone present, how close are important anatomical structures from the site for future implant etc. Using available software for detailed analyze, precise measurements can be performed. This way your dentist will know exact dimensions of future implants, and their ideal positions while preserving important anatomical structures from any potential damage. The most common problem in planning implants is a deficiency of bone tissue around the implant site. This usually affects lower jaw, while in the upper jaw the most common problem presents the position of the floor of maxillary sinuses. In these cases, your dentist will probably suggest pre-implant surgery in order to improve the quality of implant site. The problem of sinus position actually means that it is too close to the site of your future implant, leaving a small amount of bone for implantation. This is why implant placement becomes impossible and surgical pre-treatment is needed. Sinus lift procedure is the solution for this problem. Your dentist will measure the exact portion of sinus that needs to be lifted and filled with artificial bone in order to achieve enough tissue for implant placement. This is another use of DVT in pre-implant planning. After tooth loss, it is normal for the bone to begin with resorption since there is nothing to stimulate the bone, so after a long period of time, the bone loss may be so extensive that makes implant placement impossible. While analyzing DVT accurate measures can be done in the place of resorption which allows your dentist to plan another surgical pre-treatment called bone augmentation. During this procedure, your dentist will compensate the lost bone with the artificial one and make enough tissue for implant placement in the future. 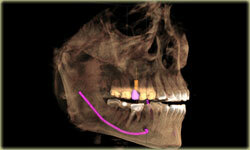 In some cases, the implantation is possible during the augmentation procedure. Besides the assessment of reliable bone for implantation DVT is useful for planning the precise position of the implant in three-dimension. This is very useful when the compromise has to be made in order to avoid pre-implantation surgeries. By changing the angle of implant, some anatomical structure can be avoided so as augmentation and sinus lift procedures. Luckily, fast development of implant systems can offer many sorts of implant superstructures known as abutment that can compensate the change of implant angle in the bone. Technology has progressed so far that even surgical guides can be prefabricated thanks to available radiographs, software, CAD-CAM systems and recently 3D printing. Surgical guides for implant placement helps the dentist to position the implant in the exact spot and under the exact angle as he planned during computer analyze. Radiation dosage of single scan for DVT is greater than conventional dental radiographs. However, with DVT only one scan is needed in order to gather all necessary information for implant planning while it would take a greater number of scans with conventional radiographs and still not collect all information needed. Simply, we should separate two-dimensional from three-dimensional scans and make it clear that it is impossible to make a good pre-implant assessment without three-dimensional scans. In general, the most important part in implantology is good treatment plan and precise measurements. This is the only way that you get good, longlasting prosthetic work on implants with no complication. By accepting all the advice from your dentist and with enough of patients you will be extremely happy whit your new smile supported by implants.